Choice Financial invites the community to “Go Hawaiian for Hospice!” Join us for the third annual luau lunch on Thursday, June 25 from 11 a.m.–1 p.m. The event will be held in the Choice Financial parking lot located at 4501 23rd Avenue South, Fargo. For a suggested donation of $5, attendees will feast on a pig roast, baked potato, fresh pineapple, Hawaiian Punch and a frozen treat. In addition to delicious food, prize drawings will take place during the event—need not be present to win. By making a donation of $25 or more, you will receive a $25 gift certificate for Maxwells (one per person)! All proceeds directly benefit Hospice of the Red River Valley. See you at the luau! 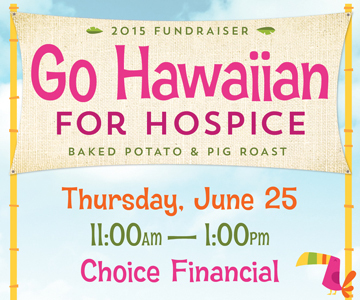 Join the Go Hawaiian for Hospice Facebook event page for more information.